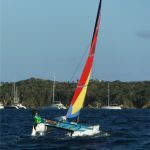 The 2018 St. Thomas International Regatta (STIR) welcomes Hobie Waves to the regatta and builds on the success of a very popular Caribbean boat. The cycles of change continue and the results of the 2017 hurricane are showing in reduced participation in some local events and even the 45 year old STIR (ex Rolex) Regatta realizes they need to encourage participation. A similar thing happened in 1990 after Hurricane Hugo decimated the local area fleets, and then STYC Commodore Richard Knoepfel called me to ask if I thought we could get together a beach cat class to help bolster the numbers at the event. 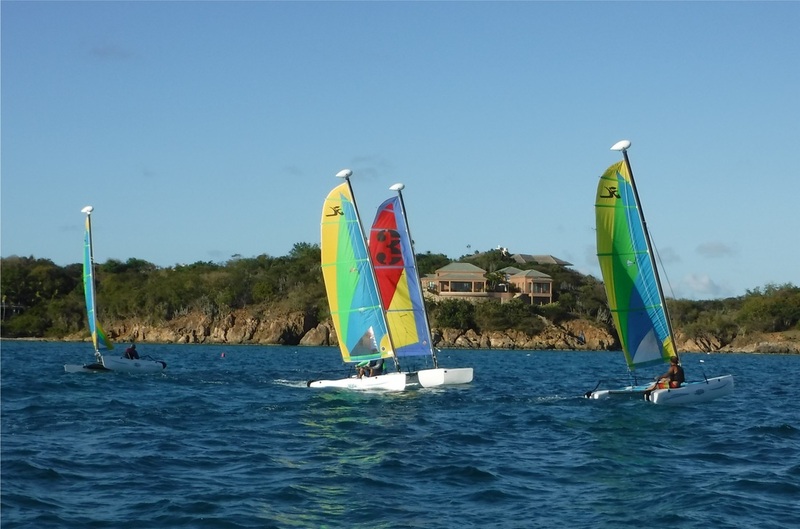 Hobie 16s had been included in this prestigious St. Thomas Yacht Club regatta for many years and been “de-invited” after one jacket and tie awards dinner “food fight”. I leapt at the opportunity to get beach cats back into our biggest regatta of the year and 4 years later we had 26 boats on the starting line for 1994. Fast forward to February 2018 and our St. Thomas Yacht Club faces the same problems after our islands weathered 2 Cat 5 storms in less than 2 weeks. 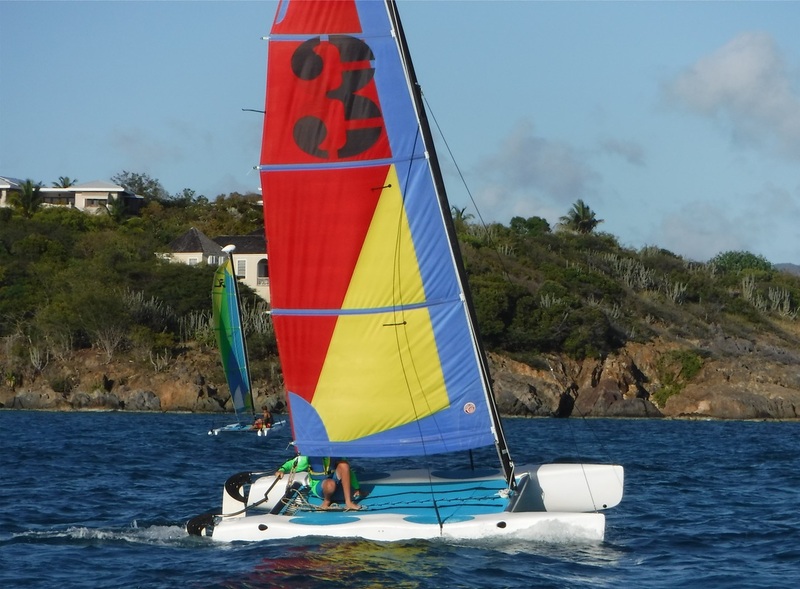 Our fleets have been dwindling and beach cats especially, with less than 5 boats sailing on average. 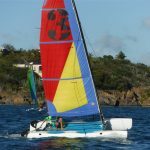 Many years ago as the cycle was repeating I swore that when my beloved Inter 20 sold I would only buy a Hobie 16 or Hobie Wave. 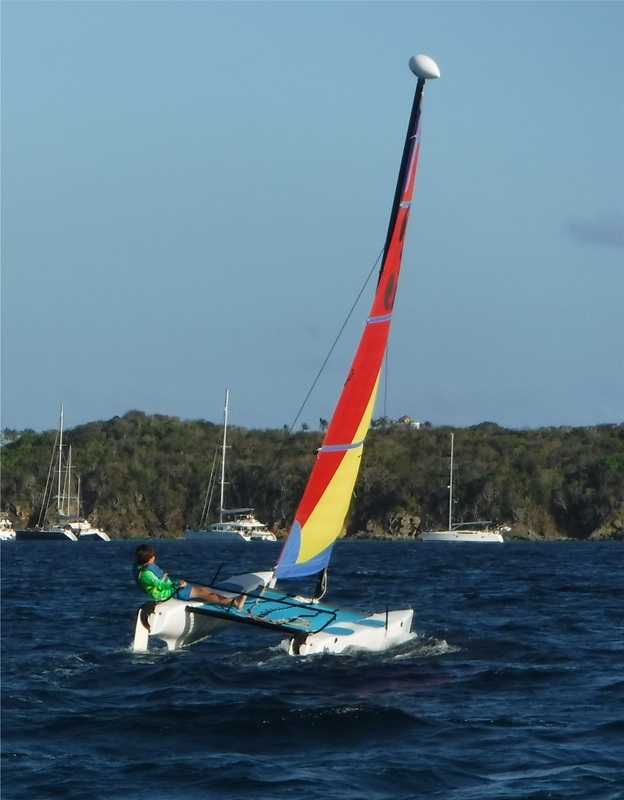 First came the 16 and my son and I made wonderful memories of sailing to St. John and sliding up on Honeymoon Beach- with highlights of representing the US Virgin Islands at the 2010 Central American and Caribbean Games and even winning our Rolex Regatta. 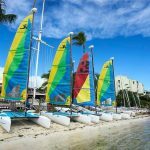 I have witnessed the “arms race” of newer and faster boats and the decline of fleets when one person wins too often (guilty)- and believe that simple one-design racing and sailing is the heart and soul of successful sailing club membership programs. 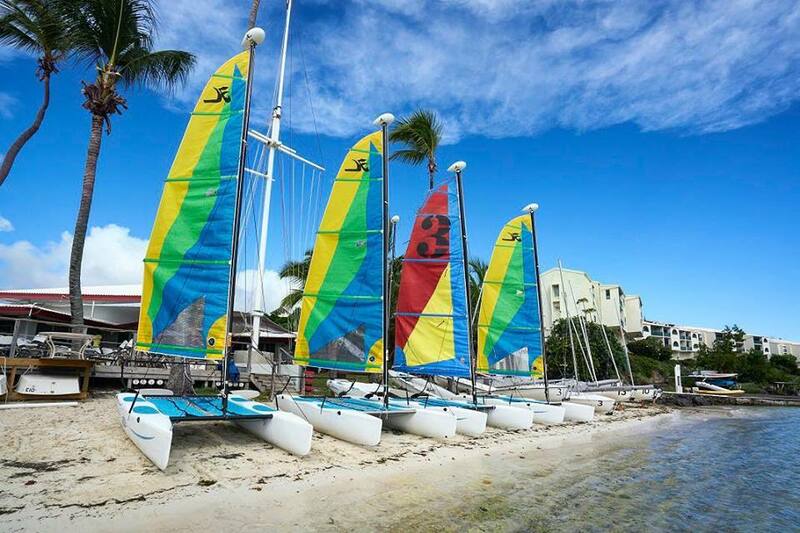 Our club hosted the first Sunfish World Championships in 1970 and the following year we had 50 boats on our beach as all ages and abilities were welcomed. I raced that event as did my whole family, and we all started on the same line- sailing against the names of our day- this on the same boat we camped with on weekends -legendary egg fights under the moon and all! I made good on my promise to buy the Hobie Wave a few years ago and Teri McKenna also made good on her threat to do the same- hers brand new, and mine was 2nd hand from a nearby resort with 13 years of tourist abuse. We sailed and laughed and took friends for rides, and lent the boats out often as people saw the easy and safe sailing we enjoyed. 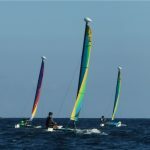 That summer our kids sailing camp was struggling with their 20 year old Sunfish and I offered the use of my Wave which was an instant hit- with numbers of kids hanging on, under and jumping off that boat. Since I paid for my Wave with quarters ($1) and really enjoyed seeing the joy on the faces of the kids and their parents- I told Teri I was going to donate my boat to the club- she said she would do the same. We both wanted to see more people sailing, so we approached then Commodre Dan Nicolosi to suggest a change to the beach scene and asking for his support. He agreed and found club funds to buy 3 more Waves bringing our fleet to 5 boats in a very short time. A 6th boat was in nearby storage with a private owner who was encouraged to donate as well- thank you Tom Turner. Teri spent hours rehabbing my old boat and it is almost indistinguishable when sailing or lined up on the beach(thanks Teri). 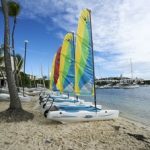 Instantly we had a fleet, or so it seems, and now we have kids signing up for “adventure Sailing” every Friday after school- no racing and lots of laughing and falling off. Soon Thursday evening racing started up and we have kids teams, parents with kids along and senior citizens all whizzing around Cowpet Bay. Hooray for wet, sandy members having fun! 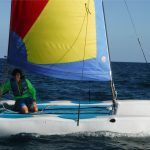 Then realty strikes me as I stand on the beach in Pensacola last year, and look at 42 Hobie Waves preparing for the 2017 Intergalactic Regatta- this is the boat that can build a clubs membership. 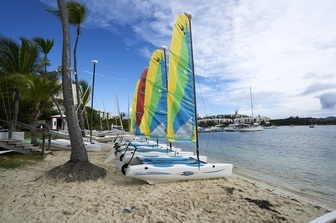 The success of the St. Thomas Yacht Club and our legion of great sailors all started with a healthy small boat fleet that was not intimidating, cost relatively little to sail, could easily be the weekend fun boat while being durable enough for kids capsize contests. 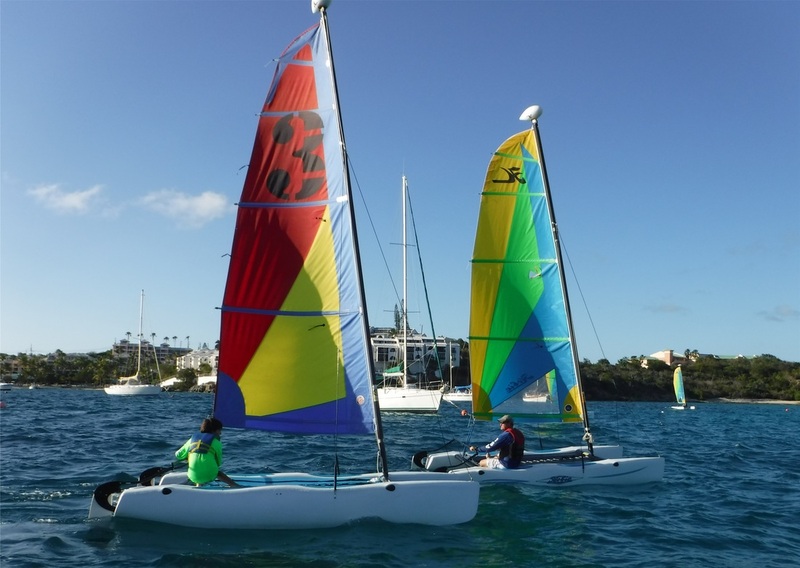 Our Sunfish sailing days built small boat skills that enabled our sailors to move into larger and faster boats with relative ease. Compare that to people trying to enter into sailing in larger boats without these basic skills- to me this is the missing link. 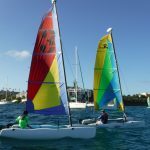 And, Sunfish owners and sailors please forgive me- the Hobie Wave seems to me- the boat that will help rebuild our yacht clubs collective participation, membership and of course, sailing skills. 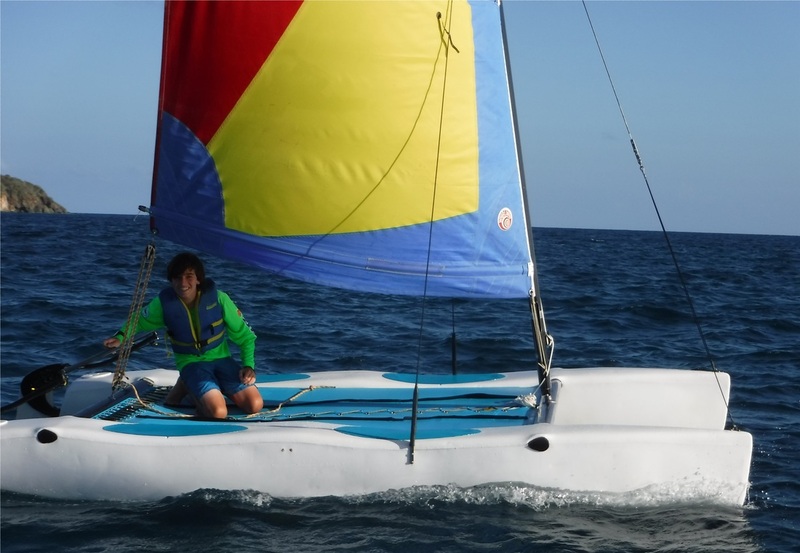 The safety, durability and “sail-a-bility” of this little “plastic” boat makes it a winner for getting more people on the water. 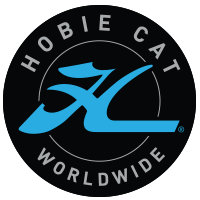 Thank you Hobie Cat and Morelli Melvin for this. I believe the success of our sports of Sailing and Racing need a healthy pipeline of new sailors – which will naturally create a pipeline of new racers too. My focus is 90 percent sailing which will bring 10 percent racers. 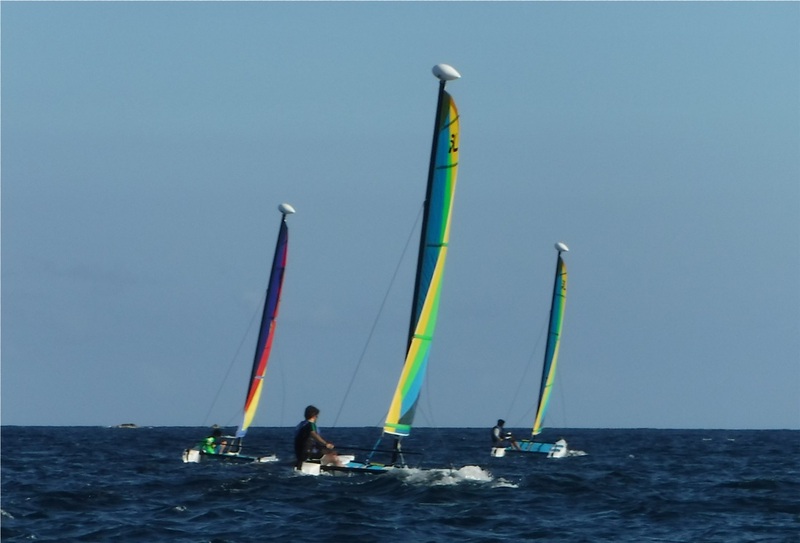 If we do not grow the “sailing” side we will not have the “racing” side of the sport. I welcome the chance to have a new class in our venerable regatta, and appreciate the efforts by Chris Rosenberg and the rest of the our Board for coming up with this idea. Upon being asked if I would participate, I immediately agreed- and offered to do a Friday afternoon beach clinic to help bolster the event and encourage participation. 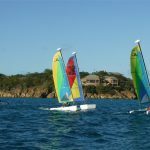 Thanks also to the St. Thomas Sailing Center who is taking up the tasks involved, and to Cruz Bay Watersports’ Chris Batchelor for donating 6 more boats for the event. 12 boats on the line and others welcome- it’s gonna be great!